Your iPad mini arrives with Apple’s default wallpaper on your home and lock screen. Yet while it takes just a few seconds to change the wallpaper on your device, it may take you a bit longer to select an image. For your iPad mini, you will likely want to select a portrait-oriented image. People often use the iPad mini held in portrait orientation, with the home button at the bottom. Of course, if you use your device in landscape orientation often, you may prefer to select a landscape-oriented wallpaper image. The most personal wallpaper image will likely be one you captured or created. But the apps and sources below offer some of the best iPad mini wallpaper options available. No wallpaper is more personal than a photo you take. You can create exactly the image you want. Photo search on your iPad Mini can take time. You may need to experiment a bit to crop your photos so they display as you desire. The best wallpaper image is the one that means the most to you. So open the Apple Photos app and choose any photo. In general, photos of people and/or pets work well for lock screen photos, while photos of landscapes or places work well as home screen wallpaper. That's because images on the lock screen are fully visible, while images on the home screen display behind app icons. Emoji wallpaper. What's not to like? No option to pay to remove in-app ads. Display a repeating pattern of emoji and/or text on top of a solid color or image you choose. Use any emoji you can type on your iPad, along with any text. Add a space to insert a gap. You can also adjust the size of the emoji. Or, tap the “Random” button to generate a coincidental combination of colors and emoji. Variety of types of photos. May take a few taps to find a specific image you want. Limited selection of images for some parks and subjects. If you like nature images, explore the photos available from the National Park Service. Their site offers access to more than 120,000 photos, most of which are in the public domain. Search for your favorite park, state, or feature, such as a mountain, canyon, or forest. Keyword search works well to find images. Browing through Unsplash is also easy. Can't filter search results by orientation or resolution. Unsplash offers a huge selection of searchable images, almost all of which can work as home or lock screen wallpaper. Even better, Unsplash licensing lets you use these images for free. Type a keyword or browse through collections. Save any image you like to your iPad Photo library. There are no bad wallpaper choices in this app. No keyword search feature to help you narrow your options. Vellum provides a curated selection of images — such as photographs, abstract patterns, and gradient color splashes — from several sources. All of the images included are portrait-orientation format. 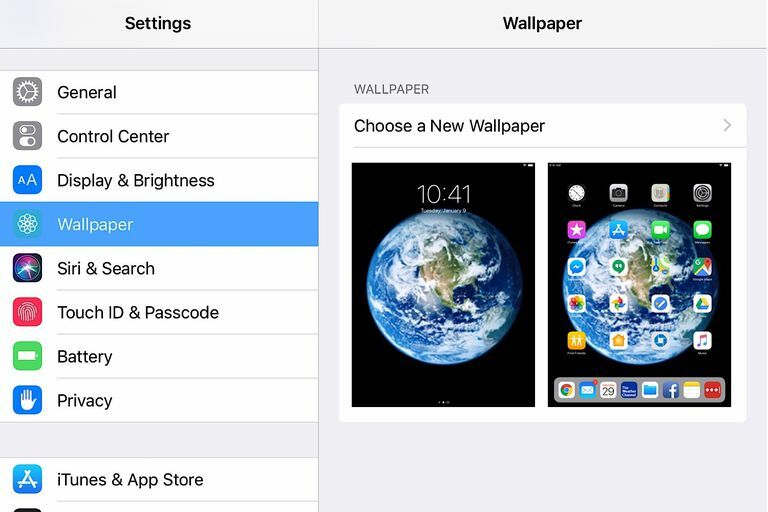 The app and images are free, although you may pay a one-time fee of $1.99 to obtain access to remove all ads and gain access to daily wallpapers from the prior four weeks.